The Women's Birthing Center at the University of Michigan Von Voigtlander Women's Hospital has 50 private rooms and helps bring 3,800 babies into the world each year. 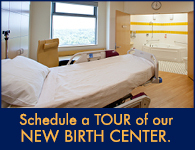 Expecting parents are welcome to tour the Birth Center. Call 734-763-6295 to reserve a tour appointment.